SUBHEAD: Breeding success of goshawk significantly dropping in North Kanto area due to Fukushima meltdowns. 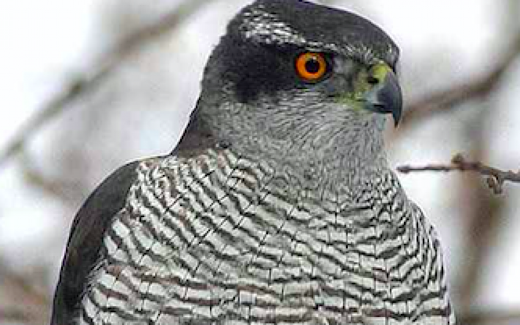 Image above: A closeup of a mature goshawk from original article. On 3/24/2015, Nagoya city university and NPO Goshawk protection fund published their report on Scientific Reports. In this report, they proved that the radioactive contamination significantly reduces the breeding success of goshawk in north Kanto area such as Tochigi etc. Especially the hatching rate is severely affected compared to the past ratio in the same area from 1992 to 2010. It was 90% in 2011, which was within the normal range of past 19 years but it dropped to 85% in 2012, and it was decreased to 67% in 2013. They concluded this significant decrease is closely related to the atmospheric dose and stated 0.1 μSv/h increase in atmospheric dose reduces breeding success by 10%. They also reported that even though the atmospheric dose comes back to the normal level as before 311, the breeding success keeps decreasing. They assume it is because goshawk is on the top of the food chain so it is severely affected by biological concentration. The internal exposure is possibly causing the long term effect in breeding success.